By Thoriq Firdaus in Mobile. Updated on April 7, 2018 . When designing, be it on the Web, for an app, or in a print product, we have to decide what colors to use on the design. There are a whole bunch of tools to help you pick the right color scheme for the job but what about one that helps you pick color schemes right from your iOS devices? 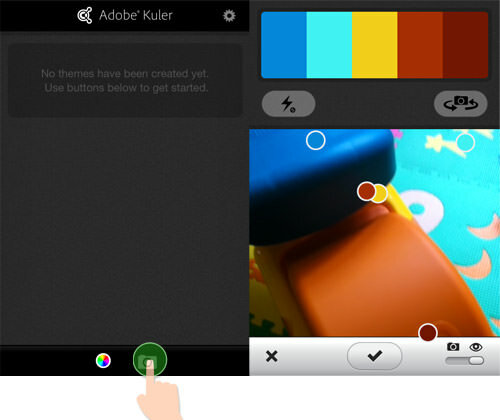 Adobe Kuler, one of the most popular color scheme generators known among designers, has launched a free iOS app that lets you generate color schemes right on the iPhone and iPad, iOS 5.1 and above. And after having a go with the app, I have to say I’m impressed with its simplicity. 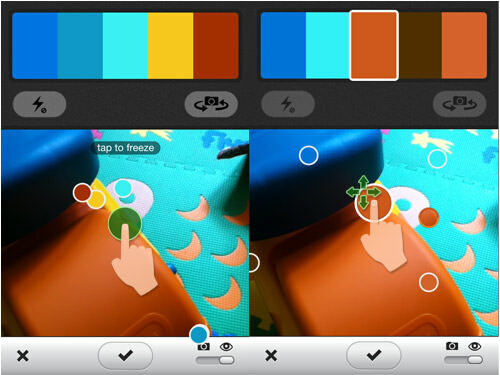 Unike the Web app, Adobe Kuler for iOS helps you retrieve colors from a photo, and even generates the color scheme instantly while we are taking a picture. Unless you are taking photos with a tripod, chances are the picture on the screen will be a little shaky and the color scheme will also keep changing. To freeze the picture, tap on the screen. 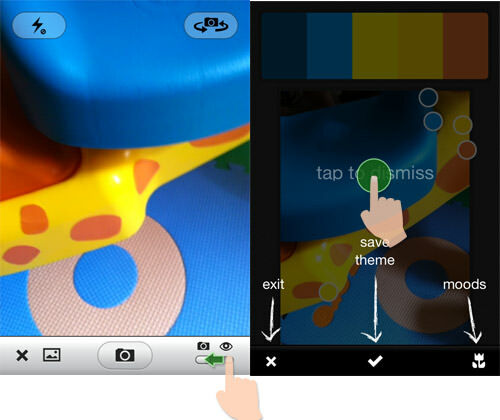 Then, move the color dots to the capture different colors from inside the picture. To automate this, make changes at the menu found at the bottom right of the app. 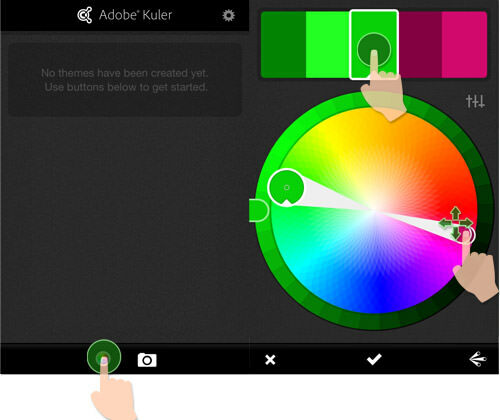 Adobe Kuler can be set to capture the color scheme when a picture has been taken. This also works with photos that have been previously taken. After the color scheme has been generated, the colors can be adjusted. The rules of adjustment can be changed to Analogous, Triad, Monochromatic or Complementary to generate different combinations. 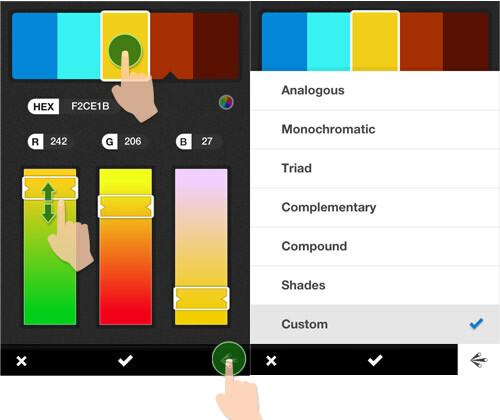 Apart from taking color schemes from a picture, this app also allows you to create a color scheme from the color wheel – just like in the Web app. By default the generated color scheme is saved locally in your phone. 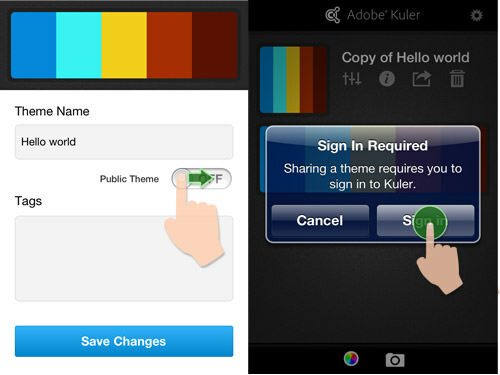 But, you can share it in Adobe Kuler using an Adobe ID. You can also set whether your collection of color schemes is viewable publicly. When using Adobe Kuler for iOS generating a color scheme becomes a lot more convenient. It is a really solid app, easy to use, and even has more capabilities over the Web app. Give it a try and let us know if you agree.